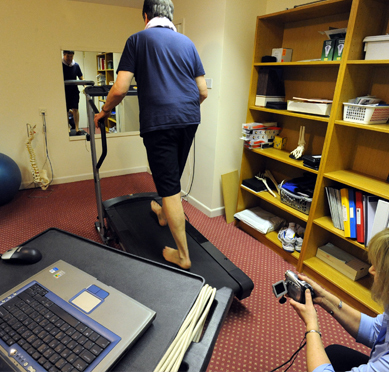 A gait and running assessment includes a biomechanical video analysis of your legs from your pelvis to your toes. This will identify the underlying cause of persistent and recurrent problems such as low back, hip, thigh, knee, ankle or foot pain particularly if this starts after exercise such as walking, running or playing sport. We can use this technology to analyse your technique for other sports too. A discussion to understand the exact nature of your problem and how it is affecting you. Posture analysis in standing, in particular the relationship of your pelvis, hip and knee to the foot and ankle. A discussion of our findings and recommendations. This will include advice on your footwear. You will need to bring shorts and a T shirt and your normal sports or running shoes to the assessment. For some people we recommend a specialist orthotic prescription. Orthotics are specially designed insoles that go into your shoe to correct your foot posture. The physiotherapist will measure and prescribe the correct orthotic for you. You will have a review session to ensure a correct fit once they have been delivered.